Reasons for concern: This very long-lived tree is a prolific seed producer. It sprouts and re-sprouts from roots and cut stumps, aggressively competes with nearby plants, and has toxic (allelopathic) properties that prevent other plants from growing. Botanical description: Fast growing, deciduous tree. Trees are either male or female. Male flowers have an offensive odor. Leaves: Large compound leaves are made up of 11 to 41 smaller, alternating leaflets on the straight stem. 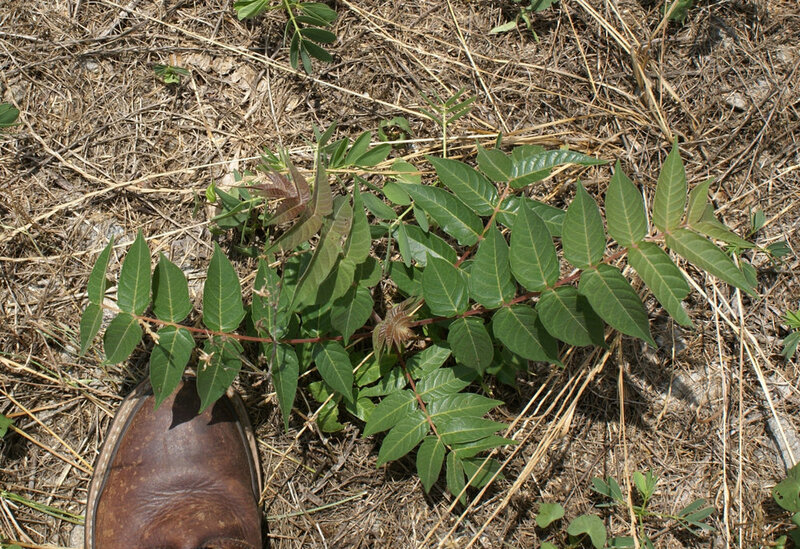 Leaves can be 1 to 4 feet long, appearing in late spring. Leaflets are lance-shaped with pointed tips, opposite each other on leaf stem, with one to five teeth at base of each leaflet. Stem(s): Trunk erect, usually only one. Smooth on young trees, rough on older trees. Light brown or pale gray-striped bark. Twigs light brown, especially when dormant. Soft and weak, creamy white wood within the stem. From 40 to 60 or more feet tall! Flowers: May to July. In clusters of small, yellow-green to white blossoms appearing at the ends of branches in summer. Five spreading petals. 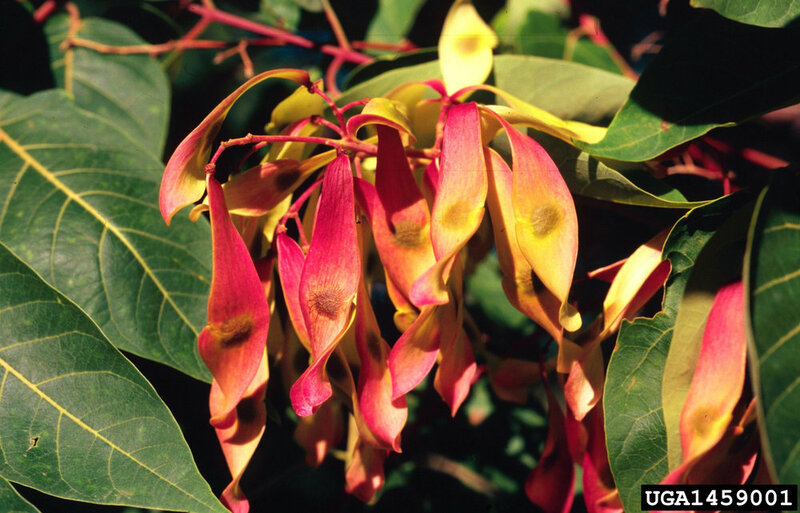 Male flowers on male trees. 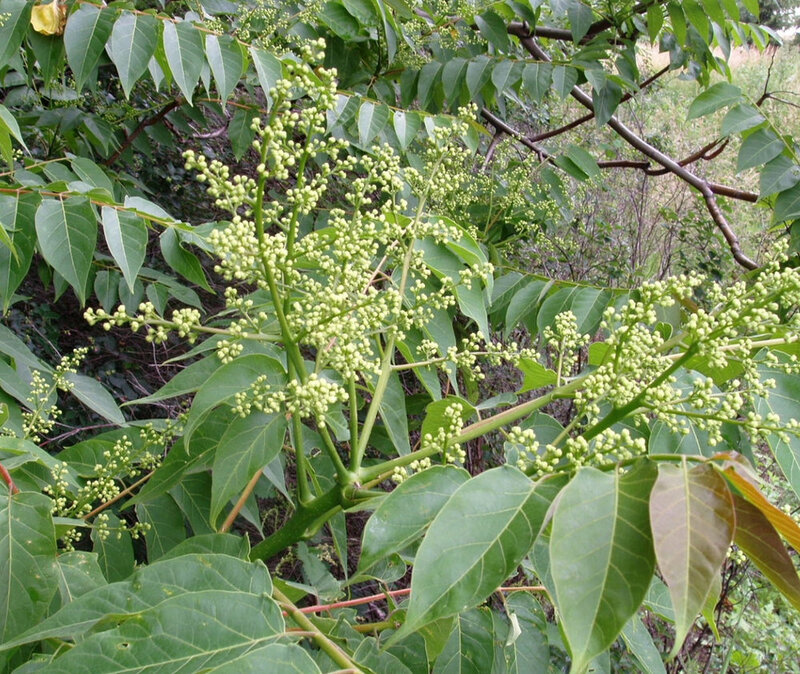 Female flowers on female trees. 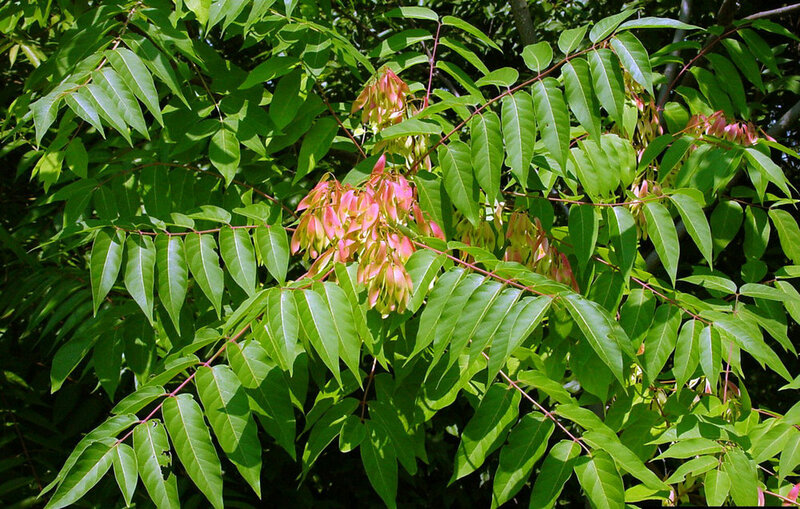 Seeds: Mature on female trees in late summer or early fall. Appear on plant in flat, twisted, paper-like wings, dispersed by wind. Seeds can stay on branch for a long time. Tan. Roots: Seedlings have substantial taproot. Mature trees have very deep taproot. Creeping lateral roots can extend out more than 50 feet from tree. Roots send up suckers easily. Native to: China. Introduced first to Europe and then to U.S. as a landscape ornamental, as food for silkworms, and as a medicinal plant for Chinese immigrants during Gold Rush. Where it grows: In disturbed areas, such as in fields and forests and along roads. In cities and towns, in alleys, streets, sewers, and foundations. Life cycle: Perennial. Lives 30 to 50 years. Reproduction: By seeds in late summer and fall. Spread by wind, water, birds, human activity, and from creeping roots. Seeds usually viable only for one year. Spread more often from roots of established trees. Weedy characteristics: One tree can easily become a clonal thicket displacing native plants and animals. Resists most insects, tolerates pollution, and can grow in most environments. Can re-grow if cut and left on ground. Produces up to 350,000 seeds on mature plant. New shoots can grow more than 3 feet per year. 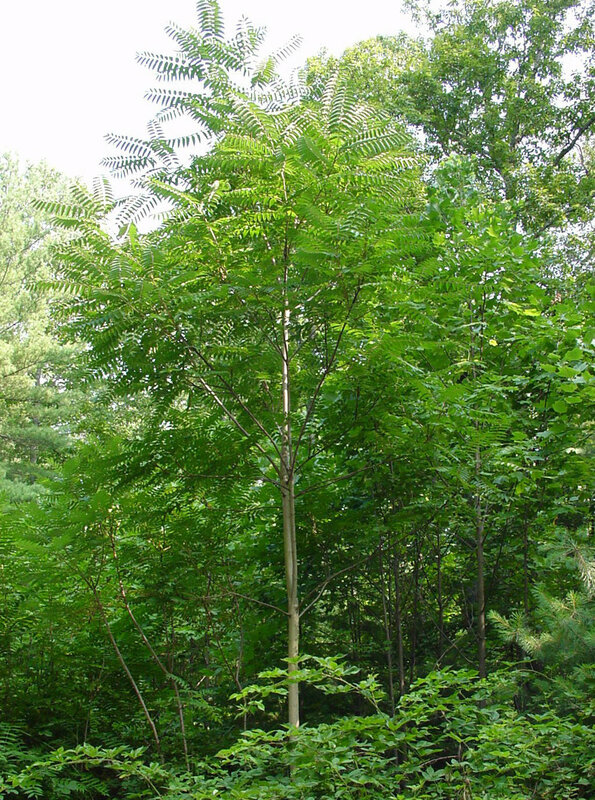 Look-alike native plants: Smooth sumac, a shrub, and some trees, like ash, black walnut and pecan. These have teeth along entire edge of leaflets, rather than just a few at base of leaf. Control strategies: Persistent hand-removal of seedlings or mowing may prevent development of thickets. Mechanical control such as cutting or girdling trunk often results in rapid production of root suckers. Herbicide applications are usually the most effective for control. Foliar sprays, treatment of cut stumps to reduce sucker production, or basal bark application are possible controls when part of a comprehensive treatment plant. Contact your local county extension office for more information on chemical control.